As I closed the last page of my book, I softly muttered “interesting” without even noticing. My mother happened to be near me at that moment. She asked me “What did you just read?” I waved the book cover to her and answered “A book about punctuation.” She winced. I would have probably winced too if I’d been my mother. She knows I’m a book worm, but sometimes my eccentricities trouble her a bit. Reading a complete book about punctuation just because you want to is kind of unheard off, no regular “reading for pleasure” material here. But I do read a couple of books like these ones once in a while. Mostly because, as a writer, I need to improve my craft. I need to know where to put the period. 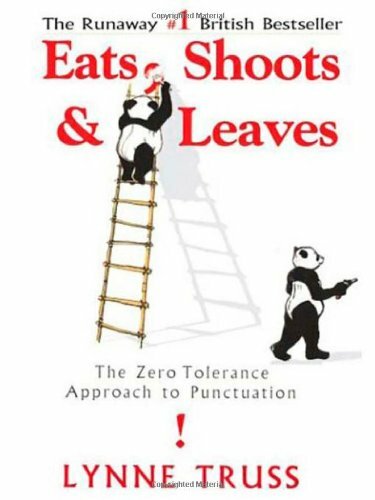 “Eats, Shoots & Leaves” is a clever and informational book where not only grammar rules are exposed, but also a wave of useful information strikes in. It’s not only about commas, semicolons, periods, dashes, etc., but also about their history, how they arrived to our world, what our crazy predecessors thought of them, how some tried to abolish their existence, and how punctuation marks strived successfully. I got attached to each punctuation mark as I would’ve gotten attached to a fiction character. Embarrassingly, I’m that quirky when it comes to books. Moreover, Lynne Truss leads us to a deeper level, to the analysis of the evolution of punctuation marks. We learn not only their history, but also how our modern times, influenced by technology and constant mobile messaging, are changing the world view towards punctuation. With good evidence, Truss foresees the punctuation world future, with upcoming years of punctuation invasion. We won’t get ridding of them any soon. Reading this book gives us an insightful perspective. We’re not only being told about punctuation rules; we’re also acquiring enough criteria to understand their evolution. But the aside note is that the book is clever and funny – British funny, humor that always makes me laugh for a reason. I enjoyed the book as much as I would have enjoyed a fiction novel. Was I the only lonely boring person reading books about punctuation? Nop, I lent the book to a work colleague. The guy loved it. He read it faster than me, just in a couple of days, again my excuse being I’m a slow reader. Would I recommend this book to everybody? Definitely. Yes. Have you ever read any type of grammar/punctuation of what it could be thought as “boring” and find yourself enjoying it more than expected? Previous What good is to travel? Haha! 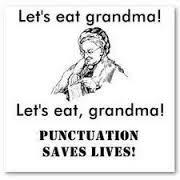 “Let’s eat Grandma!” is hilarious. I am a stickler for punctuation, so I think I’d enjoy that book. Thanks for sharing. I loved this book. It made me giggle the first time I read it (and I thoroughly appreciated it) and I’ve kept it around since.